Note: Over-the-counter supplements containing ephedra were banned by the U.S. Food and Drug Administration (FDA) in May 2004. See below for additional information. Ephedra (Ephedra sinica), also called ma huang, is an herb that has been used in Traditional Chinese Medicine (TCM) for more than 5,000 years, primarily to treat asthma, bronchitis, and hay fever. Ephedra is also prescribed for symptoms of cold and flu, including nasal congestion, cough, fever, and chills. While ephedra is a naturally-occurring herb, its main active ingredient ephedrine can also be synthesized as a medication. Synthetic ephedrine compounds, such as pseudoephedrine, are widely used in over-the-counter cold remedies and are regulated as a drug. This is unlike the regulation of ephedrine alkaloids derived from the herb itself. These are regulated as dietary supplements. Until May 2004, ephedra was sold commercially as an energy booster, weight-loss supplement, and athletic performance enhancer. Although some scientific evidence suggests that this herbal supplement may improve weight, the information overall regarding its effectiveness for weight loss, energy, or athletic performance has been inconclusive and controversial. In addition, ephedra-containing products sold for these purposes have been linked to many cases of stroke, heart arrhythmia (irregular heart rhythm), and even death. Several of these products also contain caffeine; the combination of ephedra with caffeine dramatically increases the chances of adverse side effects. It is important to note that ephedrine-containing products are banned from amateur sporting events, and evidence of ephedra on drug testing will likely disqualify athletes from competition. The FDA ban on this substance includes any dietary supplements that contain ephedra, ephedrine, norephedrine, ma huang, Sida cordifolia, or pinellia. This does not pertain to teas (which are regulated as a conventional food) or to traditional Chinese herbal remedies prescribed by a traditional Chinese physician. Ephedra is a shrub that is native to Pakistan, China, and northwestern India. Some ephedra species grow in the Southwest desert of the United States. 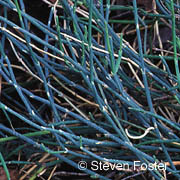 The ephedra plant is a perennial evergreen that stands 1 foot high, on average. But it may grow up to 4 feet. Nearly leafless, the plant has slender, cylindrical, yellow-green branches and underground runners. In August, the flowers bear poisonous, fleshy, red cones resembling berries. The 3 ephedra species, ephedra sinica, ephedra equisetina, and ephedra intermedia, are collectively known by their Chinese name ma huang. The young stems and branchlets are the parts used for medicinal preparations. Ephedra can come in dried or liquid form. It can be taken as a tablet, capsule, or as a tea to drink. Ephedra should be used only on a short-term basis because prolonged use may lead to addiction. The amount of time considered safe, however, is not clear. Use of ephedra should take place only under the guidance and supervision of an appropriately-trained specialist. Ephedra should be taken between meals, without food. The American Botanical Council warns that anyone under the age of 18 should not use ephedra without strict medical supervision. Ephedra supplements have been banned from the U.S. market. People living outside of the U.S. should use caution, and work with a highly trained practioner when considering the use of ephedra. Herbs contain active substances that can trigger side effects and interact with other herbs, supplements, or medications. For these reasons, you should take herbs only under the supervision of a health care provider knowledgeable in the field of botanical medicine. Ephedra can produce side effects, such as irritability, restlessness, anxiety, insomnia, headaches, nausea, vomiting, and urinary problems. More serious side effects include high blood pressure, rapid or irregular heartbeat, stroke, seizures, addiction, and even death. If you experience any of these adverse effects, discontinue using ephedra and contact your provider immediately. You should not take ephedra if you have the following health conditions: anxiety, depression, high blood pressure, glaucoma, heart disease, prostate enlargement, difficulty urinating, seizure disorder, impaired circulation to the brain, psychiatric disorders, thyroid disorders, or diabetes. Anyone taking medications for high blood pressure or depression, and women who are pregnant or breastfeeding, should avoid ephedra and ephedra alkaloids such as ephedrine. To determine whether ephedra is safe and appropriate for you, consult a knowledgeable provider. Amphetamine and amphetamine derivatives. Amphetamine and amphetamine derivatives (such as dextroamphetamine, sometimes used for attention deficit hyperactivity disorder and narcolepsy) should not be used with ephedra. Ephedra may cause increased effects of amphetamines on the body, such as increased heart rate and blood pressure. Antidepressants. Ephedra may interact with antidepressants, namely those in the class of tricyclics (such as clomipramine, desipramine, doxepin, imipramine, and nortriptyline) and monoamine oxidase inhibitors (MAOIs, including phenelzine and trancylcypromine). Aspirinand blood-thinning medications. Ephedra may increase bleeding in sensitive individuals, such as those taking aspirin or other blood-thinning medications. Blood pressure medications. Ephedra may interact with blood pressure lowering medications, particularly clonidine. Narcotics. Ephedra may interact with narcotics prescribed for pain, such as morphine and codeine; codeine may also be prescribed for cough. Theophylline. Ephedra may interact with theophylline (used for asthma). Auerbach. Auerbach: Wilderness Medicine. 5th ed. Philadelphia, PA: Elsevier Mosby; 2007. Ang-Lee MK, Moss J, Yuan C-S. Herbal medicines and perioperative care [review]. JAMA. 2001;286(2):208-16. Blanck HM, Khan LK, Serdula MK. Use of nonprescription weight loss products: results from a multistate survey. JAMA. 2001;286:930-5. Blumenthal M, Goldberg A, Brinckmann J. Herbal Medicine: Expanded Commission E Monographs. Boston, MA: Integrative Medicine Communications; 2000:111-7. Boozer CN, Nasser JA, Hemsfield SB, Wang V, Chen G, Solomon JL. An herbal supplement containing Ma Huang-Guarana for weight loss: a randomized, double-blind trial. Int J Obes. 2001;25(3):316-24. Bucci LR. Selected herbals and human exercise performance. Am J Clin Nutr. 2000;72(2):624S-36S. Cohen PA, Ernst E. Safety of herbal supplements: a guide for cardiologists. Cardiovasc Ther. 2010;28(4):246-53. Council for Responsible Nutrition. Cantox Health Sciences International Safety Assessment and Determination of a Tolerable Upper Limit for Ephedra. Accessed on October 25, 2001. Federal Register. Department of Health and Human Services. Food and Drug Administration. Dietary supplements containing ephedrine alkaloids. April 3, 2000;65(64):17509-12. Food and Drug Administration. Consumer Alert: FDA plans regulation prohibiting sale of ephedra-containing dietary supplements and advises consumers to stop using these products. December 30, 2003. Accessed on May 5, 2004. Gurley BJ, Gardner SF, Hubbard MA. Content versus label claims in ephedra-containing dietary supplements [see comments]. Am J Health Syst Pharm. 2000;57(10):963-9. Hallas J, Bjerrum L, Stovring H, Andersen M. Use of a prescribed ephedrine/caffeine combination and the risk of serious cardiovascular events: a registry-based case-crossover study. Am J Epidemiol. 2008;168(8):966-73. Haller CA and Benowitz NL. Adverse cardiovascular and central nervous system events associated with dietary supplements containing ephedra alkaloids. NEJM. 2000;343:1833-8. Health Canada. Advisory not to use products containing Ephedra or ephedrine. June 14, 2001. Accessed on 10/25/01. Jalili J, Askeroglu U, Alleyne B, Guyuron B. Herbal products that may contribute to hypertension. Plast Reconstr Surg. 2013;131(1):168-73. Lee MR. The history of Ephedra (ma-huang). J R Coll Physicians Edinb. 2011;41(1):78-84. Miller. Miller's Anesthesia. 7th ed. Philadelphia, PA: Elsevier Churchill Livingstone; 2009. Miller SC. Psychiatric effects of ephedra: addiction. Am J Psychiatry. 2005 Nov;162(11):2198. Palamar J. How ephedrine escaped regulation in the United States: a historical review of misuse and associated policy. [Review]. Health Policy. 2011;99(1):1-9. Seamon MJ, Clauson KA. Ephedra: yesterday, DSHEA, and tomorrow -- a ten year perspective on the Dietary Supplement Health and Education Act of 1994. J Herb Pharmacother. 2005;5(3):67-86. Vahedi K, Domigo V, Amarenco P, Bousser MG. Ischaemic stroke in sportsman who consumed MaHuang extract and creatine monohydrate for body building. J Neurol Neurosurg Psychiatry. 2000;68(1):112-3. Wang J, van der Heijden R, Spruit S, Hankermeier T, Chan K, van der Greef J, Xu G, Wang M. Quality and safety of Chinese herbal medicines guided by a systems biology perspective. J Ethnopharmacol. 2009;126(1):31-41. Woolf AD, Watson WA, Smolinske S, Litovitz T. The severity of toxic reactions to ephedra: comparisons to other botanical products and national trends from 1993-2002. Clin Toxicol (Phila). 2005;43(5):347-55.